Since its US debut Aventador portrayed its commendable innovation with every model. We accept that just like the Superveloce released in recent past this one too is very close to a race model but with less weight and more horses taking you to an outrageous ride. 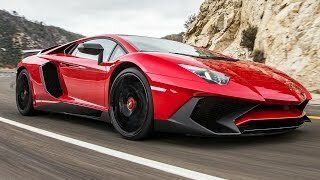 Let’s have a detailed sneak into what all the new Lamborghini Aventador LP 750-4 Superveloce holds. The interior of Lamborghini Aventador LP750-4 Superveloce gets a very good upgrade in its interior. Lamborghini has made the carbon-fiber monocoque more visible in this model in comparison to base model. Apart to reduce the weight carbon fiber seat shells are wrapped with Y-shaped leather inserts made from Alcantara making it beautiful. For Aventador SV a new soft yet tough form of carbon fiber named as ‘carbon-skin’ is used for headliner and other parts where hands might reach often. The SV Aventador instrument featuring blue shift indicator and G-force meter is dominated by yellow. In all the interior walks well in terms of both looks and comfort. 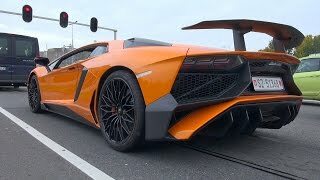 There can’t be any doubt of Lamborghini Aventador LP750-4 Superveloce exterior not being handsome but this time with its looks to adore its power model gets 50 Kg lighter than the base model and touches the curb weight of 1,525 Kg. To reach this target impeccable contribution came from the door panels, rear wing and fixed air intakes made from carbon fiber. Also to add name to the weight-loss technique use of SMC was noticed in making rocker panels and fenders. In all for a normal buyer the Aventador SV is gorgeous while for a technician it is both gorgeous and a great work by engineers. 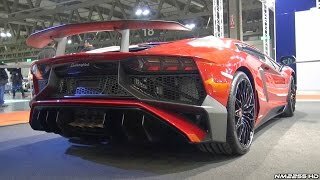 With its 6.5 Liter V12 engine Lamborghini Aventador LP750-4 Superveloce spark the model by producing 740 hp @ 8400 rpm and 690 nm of torque @ 5500 rpm mated to ISR manual transmission. With these specs the model unbeatably reaches a top speed of 217 mph and covers the 0-62 mph sprint in just 2.8 second; yes this is 0.1 seconds faster than the base model. Last under the segment we would mention is the three driver settings SV Aventador offers; Strada for on road daily driving, Sport works like its name and the most powerful Corsa. The Lamborghini Aventador LP750-4 Superveloce settles at a price of $365,693 and looks ahead to battle in market against Pagani Huayra and Ferrari F12 Berlinetta.